Join Hilda and her friends on their mission to discover, befriend and collect all the weird and wonderful creatures of Trolberg and the surrounding Wilderness! The enchanting world of Hilda Creatures awaits. Based on the hit comic series by Luke Pearson, and now a Netflix Original Series, this is the start of your own adventure alongside our blue-haired heroine. Place items and wait to see who shows up: will it be a tiny Elf, a fluffy Woff or maybe an enormous Troll?! Watch the creatures play with the items, chat and picnic with them, then capture the moment with your camera! Meet them all, collect memories and new friends, and fill up your Friendship Book. 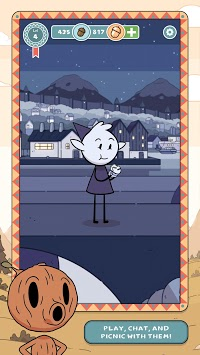 Just like Hilda, you can wander the Wilderness or take to the bustling city of Trolberg. Each is home to many interesting spots such as a waterfall or quaint town square. Visit one and try laying out some items - perhaps an irresistible snack, some pretty flowers, or a snazzy jazz record? Is your backpack empty? 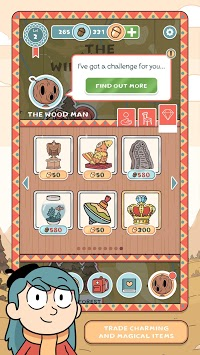 The Wood Man is always there to trade with… Don’t worry, he’s grumpy and indifferent with everyone. The Wood Man accepts the acorns you’ve collected as payment for all kinds of knick-knacks. Use carefully selected combinations of items to attract Woffs, Trolls, and other peculiar creatures. They might even pop by when you’re not around and leave a present - how thoughtful! If you catch someone while they’re visiting, you can get to know them better over a chat or some food - if they’re cute and fluffy maybe all they want is a little pat on the head. Bad-tempered and destructive, or sweet-natured and calm? You’ll encounter all sorts! But most importantly, see if you can catch them in a funny pose for your photo collection. Cute characters from the comics and Netflix Original Series - with new faces too! Daily missions, Weekly missions, and other Achievements mean you’re always expanding your Sparrow Scout badge collection! Good grief, there’s so much to do… But such is the life of an adventurer! You’d better get going if you’re going to be home before the troll rocks come to life…. Hi, we’re BIGUMAKU. We combine leading-edge art with innovative gameplay to create games for kid in all of us. Note: This is a free to download game with optional in-app purchases. 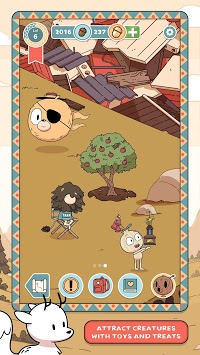 The Hilda comic books are © Nobrow Ltd. and Luke Pearson. Hilda comics are published by Flying Eye Books, an imprint of Nobrow Ltd.